United Nations, New York, Feb 16, IRNA - Fifteen members of the UN Security Council on Thursday unanimously condemned terrorist bombing in Iran's southeastern city of Zahedan. Eleven people were martyred and 31 others injured in a terrorist attack in Zahedan, capital of southeastern province of Sistan- Baluchestan, Wednesday morning. 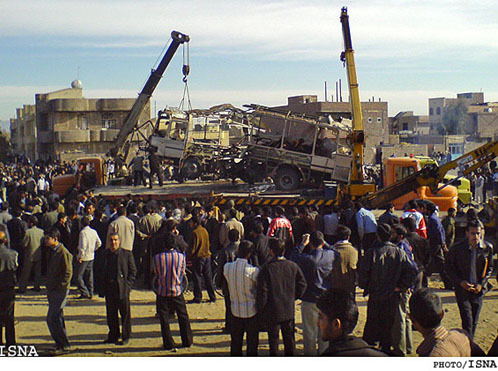 The attack was perpetrated by "saboteurs" who detonated a car bomb near a bus belonging to Zahedan's Islamic Revolution Guard Corps (IRGC). In a statement, issued by the Security Council, it was stressed that no pretext could justify such terrorist measures. It said agents and organizers of the terrorist act should be handed over to judicial officials. The states expressed their deep condolences to the families of victims and the Iranian nation. The UN Secretary-General Ban Ki-Moon also on Wednesday condemned the terrorist bombing in Zahedan. In a statement, he said there was no pretext to justify the terrorist violence at all. He also expressed his condolences to the families of the victims and the Iranian government.